Eight a.m and I slip out of the house without eating breakfast. I’m not sick or on a diet but working as a judge co-ordinator for the UK Guild of Fine Food and need to stay hungry. Today, at the Great Taste Awards London office, I am going to taste 40 or more food and drink products. Taste is the key criterion in this annual competition. In 2017, more than 40 judges will sample 12,000 food and drink products blind. They don’t see the packet, jar, bottle or box, the marketing, price or advertising copy, so are impartial. My job as judge co-ordinator is to: summarise what my panel thinks; provide feedback; help the team decide if the product is award-worthy; and if so, agree on a one, two or three star-award. Three stars – we like this product so much that we’re not going to leave this room until we know where to get our hands on some. There are only 50 winners of this Gold award every year. Blind tasting: judges don’t see the packaging, marketing, price or advertising copy so are impartial. Tasting fine food all day is no picnic. 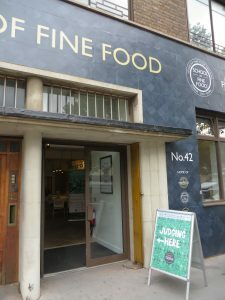 Judges taste 20 products in a session and if tasting the whole day, may baulk at the idea of a Thai ready meal after rosemary fudge, banana curd, prawn and coconut crisps and matcha vinegar. (It would be indiscreet to name real products so I made these up.) After several sweet products in a row, we crave something savoury, and vice-versa. Experience has taught me to use a ‘spit cup’. This confuses my tummy which expects food after salivation and mastication. The closer it gets to lunchtime the more likely I am to swallow. The upside is that we get to see emerging trends, meet food industry colleagues and learn loads. Part of the judges’ job is to give constructive criticism. If the product is not an award-winner, how could the makers improve it? Over the years, I have learnt from colleagues that the success of many products depends on balance. For example, you can improve over-sweet choc chip cookies not, as you’d expect, by reducing sugar, but by using better quality, darker, chocolate chips. With spicy foods, it’s important to cook out the spices so they don’t taste raw. Or add more salt to make the spices sing. Innovation is the lifeblood of the food industry but there needs to be a good reason to add a fashionable ingredient; invariably, less is more. It’s also true that though the awards are about taste, the other senses matter. Golden pastry is more appetising than pale pastry. Grainy chocolate, crystals in ice cream or jam tarts so crumbly they collapse when you pick them up are faults of texture. If judges think the product smells horrid, they will be predisposed to dislike the taste, too. Taste is subjective and changes with age. Will this carrot cake taste as good as it looks? I notice that younger colleagues light up at the arrival of what my father-in-law would call a ‘goo-cake’ while older judges show more enthusiasm for a meat pie. If they hesitate, it’s not an award winner. 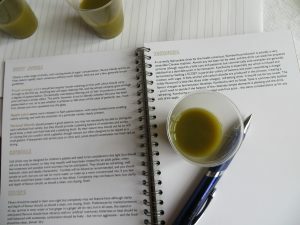 The hardest products to judge are the likes of salt, oil, herbs, and spices. 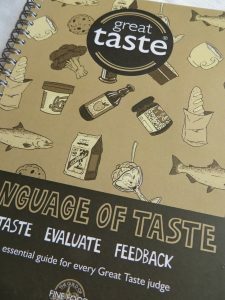 For this reason the Guild of Fine Food has compiled a 136-page tome on the language of taste. I learn from this that ‘a number of in-store bakeries use a sourdough powder to add tang without the other characteristics associated with a starter and long fermentation’. I had wondered if supermarket sourdough loaves were the genuine article. Great Taste Gold award winners shine out. What a thrill to discover a champion after a run of so-so entries. I want to serve it, eat it or get it into my kitchen for mad experimentation. And suddenly it’s 4.30 pm. Am I the only one feeling just a bit icky after a hard day’s judging? I ask fine food consultant and Great Taste Arbitrator, Scott Winston, who presumably is made of sterner stuff than I. Well, there’s a relief. It’s not just me. Home to pick at cucumber, fennel, lettuce, carrot and apple. I crave greenery to enliven and relieve my overstimulated palate. Surprisingly, I have a healthy appetite for dinner. All that tasting is hungry work. 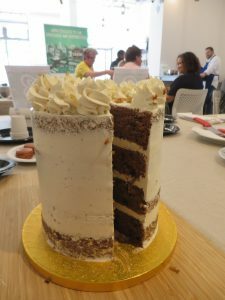 Have you been a judge in a food competition and what was it like?